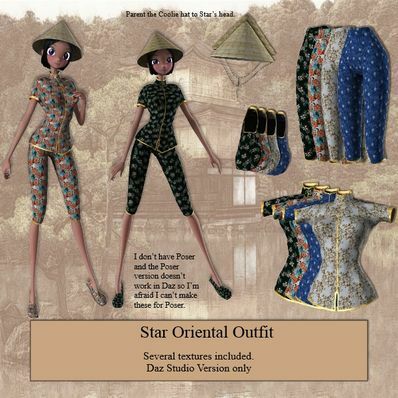 Oriental Outfit for STAR for use in Daz Studio 4.6. Parent the Coolie Hat to Star's head. Thanks so much again this is so awesome. You are rock true gem you are. ERROR: Product Download File was not found. And you deliver another great one!! Thanks so much! Just loved the Poser one, it worked perfectly in DAZ Studio 4.7!! You're the BEST!! Sweet!!! You might contact Sanbie or Dragonbreath to help with the Poser one. Just an idea.